Looking for an experienced and reputable gas boiler installation company on the Wirral? Then let Cureton Gas Services be your first choice for all your domestic installation, servicing and repairs for gas, gas boiler and central heating appliances. We are a trusted, full qualified provider with over 22 years’ experience in all aspects; specializing in servicing customers across many areas, including: Wirral, Chester, Ellesmere Port, Wrexham and North Wales. We guarantee all our customers a fast, dependable and flexible service. Our emphasis is on safety, care and above all professionalism with every job we are responsible for; giving you ultimate satisfaction, value for money and peace of mind when completed. We are proud to be a gas safe registered firm of gas engineers; achieving quality standards while adhering to strict gas safety guidelines. Why choose Cureton Gas Services? 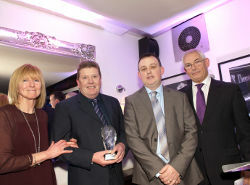 Andy & Neil receive their trophy as part of the Wirral Trader of the Year Awards. heating installer and repair company in the Wirral area. our standing continues to grow as a company you can trust. highest quality solutions within a tailor made cost effective framework. excellent customer satisfaction through our personal and professional manner. customers can buy good or services with confidence from Wirral traders. excellence within our field. It’s our guarantee. If you’re looking for Worcester boiler repairs in Birkenhead look no further than Cureton Gas. We are specialists in dealing with all types of Worcester boiler repairs in Birkenhead so why not contact us today for more information. If you’re needing boiler repairs why not contact Cureton Gas? We have become the leading specialist heating installer and boiler repairs company in the Wirral area. Our name is synonymous for quality and expertise, affording the same due care and attention to every job. If you’re needing boiler maintenance why not consider the Wirrals leading specialist, Cureton Gas? we offer a wide range of specialist services to the domestic market including extensive gas boiler servicing, installation and boiler maintenance and all gas system and central heating repair. All makes and models of water heaters need gas boiler maintenance in Wirral which is important to do at least once a year. When you need a boiler fitted in Chester and there’s no time to lose, don’t take chances; call Cureton Gas Services for fast dependable service. You may need a Powermax replacement boiler in Moreton when your heating equipment ages and becomes inefficient. For all your home heating installations. Prove you're not a spammer 1+4=?